It seems like a lot of businesses are bringing a second server online lately, perhaps discovering the benefits a Terminal Server (or Remote Desktop Services Server or even Multipoint) can bring, or maybe it is a Server that will run SQL for an LOB application. Personally i prefer to keep the SBS free of Apps if possible, especially accounts programs. The SBS PAO (Premium Add on) Is a great way to get that second server and SQL license, but it may not be the most cost effective route to get what you want, so make sure you do your research before purchasing. That’s my little marketing pledge done, now on to the technical stuff. If you are familiar with installing SBS and general networking, likely you know already how to add a second server to an SBS Standard network, but what about essentials? Do you try to install the connector? Do you use the traditional ‘Computer Name’ tab in System Properties? Does it show up in the Dashboard? Does it get backed up? Connector or Not Connector that is the question! Firstly you need to ask what OS is your server. 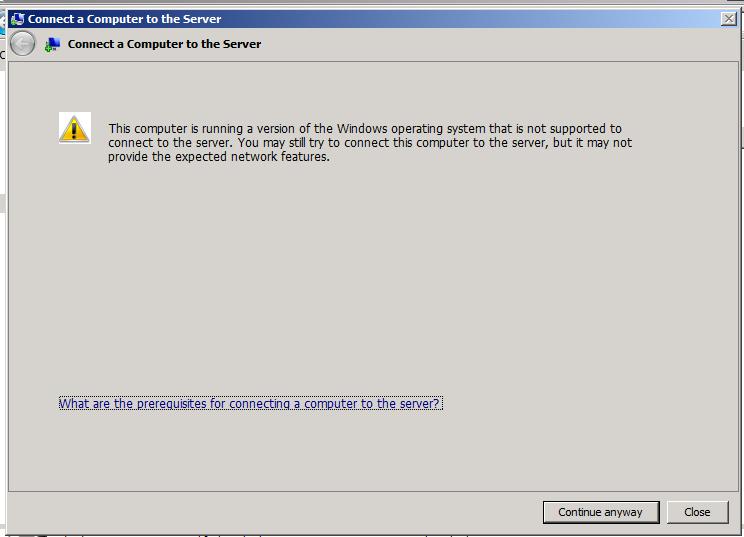 Is it Server 2008, 2008 R2 or maybe an older 2003? The connector software will install on Server 2008 R2 Standard, IF you are running SP1, and also if your Server is NOT a Domain Controller. 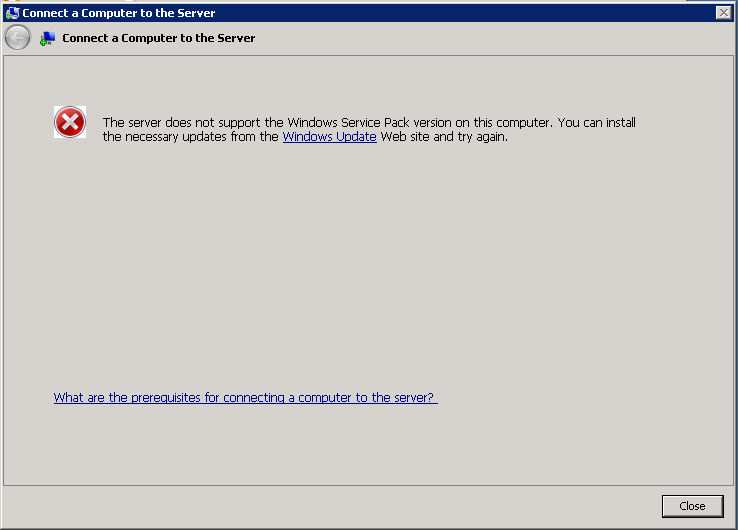 If you are not running SP1 you will see this message if you attempt to install the Connector software. If you want to know which OS’s and Versions are supported, check out the ‘supportedOS’ XML file on your essentials box. Assuming you meet the requirements you will be presented with a warning about Supported Client OS’s and you can click on ‘Continue Anyway’ to continue the installation. 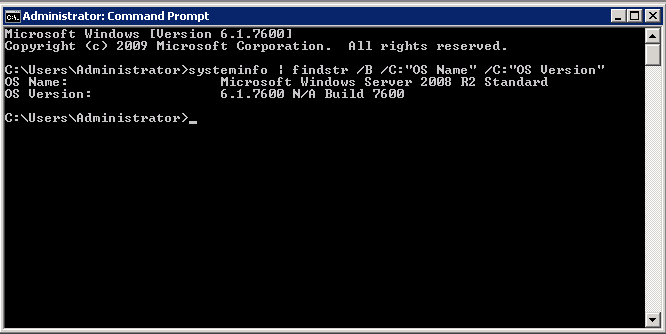 You may want to note that it is not possible to install the connect when logged on using Remote Desktop. Also the same problems affecting install on Client OS’s can strike on a Server install. Plenty of resources out there for those, but my post is where i will point you. Adding the connector is not supported. You get a big warning to the same effect. If you do decide to install the connector it is at your own risk, i am not going to be held responsible for anything, whether it works or doesn’t work, whether it works some of the time and whether it makes you look silly. By reading this disclaimer in your head or out loud you have waived any legal responsibility on my part in perpetuity throughout the universe. Is it in the Dashboard? Yes. If you install the connector then it will indeed show up in the dashboard. The short answer? Yes it does. It does appear that the SBS Essentials ‘Client Backup’ will backup the server OS. However, i have to stress this is not supported, and because of that there is no guarantee from anyone, Not me, Not Microsoft that you could successfully restore your server from that backup. The SBSE client backup does not contain ‘agents’ for the Server OS or any applications you may be running on it, like SQL, so a backup with the SBSE client backup cannot be trusted, or guaranteed. If you are going to have the Server show up in the dashboard, i recommend you disable the SBSE backup, and instead rely on your own backup strategy for the Server, but i am not discussing that in this post. You can disable the backup from the dashboard, by clicking ‘Customise Client Backup for the computer’ and clicking disable backup. You may also want to disable the launch pad. The launch pad runs, or at least seems to run, perfectly well on the server. I set my test server up as a RDS (TS / Terminal Server) and logged into with two separate accounts, and the Launchpad ran fine for both. The only thing i didn’t like was that a helpful or considerate user may want to poke around the backup settings, and that could be bad, so to remove temptation, my advice would be disable it. Likely as not you wont need the Launchpad on that server anyway. You can disable the Launchpad through the registry, or via MSCONFIG. This Server OS, is supported for use with Essentials, can handle the Connector install, and perhaps most importantly, is also supported to be used with the SBSE Client backup. If you haven’t heard of, seen, or used WMS, then get yourself along to the SMB MVP Community Road Show and see it in action. Since SBS 2008 CALS are now based on Microsoft’s honour system, and they are no longer ‘installed’ and ‘activated’ when you buy them. You just purchase the number of CALS you need, and keep them safe. Small Business Server 2011 Standard, still ships with 5 CALs. Even better, with SBS 2011 Essentials, there are no CALS to purchase. SBS Essentials, is a one off purchase. If you buy it today and have 4 users, you pay the same price as someone who has 10 users, or someone who has 25 users. The Essentials OS is licensed for up to 25 users, but those ‘licenses’ are included in the fee you pay to purchase the software. I know, i can see some of you at the back sneaking up your hands to ask..
Because of the unique way Essentials is ‘licensed’ those invisible CALs only allow you to access the Essentials box itself, so unlike it’s big brother, SBS Standard, if you purchase a standalone member server (not a PAO Server) you must also buy full Windows Server CALs. SBS Standard has a more traditional CAL model, so SBS Standard CALs grant access to ANY member server, regardless of whether it is a PAO or not. If you don’t install the SQL component, then you don’t need to purchase any additional PAO CALS. The CALS for SBS 2011 Standard or Essentials, allow you to access the Windows Server technologies of the PAO server, as long as you are not accessing the ‘Premium’ services, so you could install it as File and Print, Domain Controller, RDS Server etc., and you would not need any additional PAO CALS, or Standard CALS." Just to add another level of complexity, if you did install the PAO server as an RDS Server, you would need to purchase RDS CALS. Well i hope you were taking notes because we now have a short test! I have Windows SBS 2011 Essentials, 10 Users all requiring access to SQL Services. What components/licensing do i need? I have Windows SBS 2011 Essentials, 10 Users, 1 NON PAO Member Server. 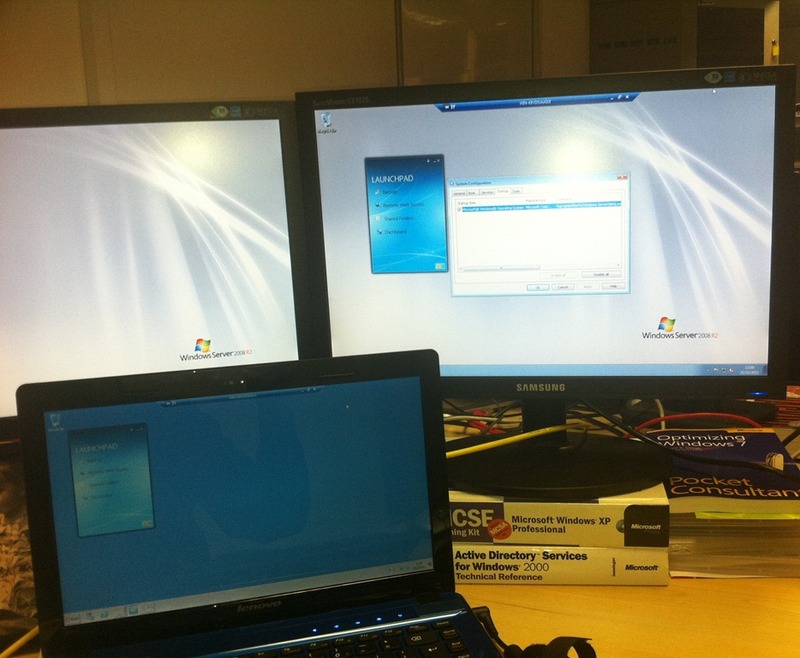 In this scenario you would have 1x Windows SBS 2011 Essentials Server, 1x PAO Server, and need to purchase 5 PAO CALs. 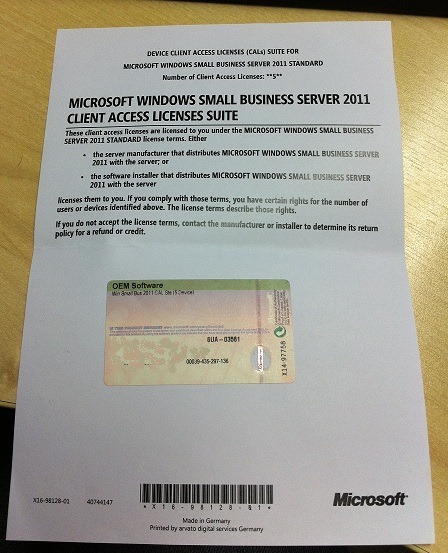 Thanks to Michael Leworthy of Microsoft for clarification on licensing points.